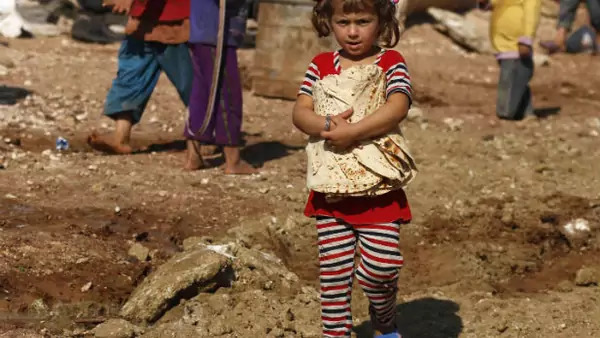 A Syrian girl carries bread in the Bab al-Salam refugee camp in Azaz, near the Syrian-Turkish border, October 27, 2014. Coauthored with Shervin Ghaffari, intern in the International Institutions and Global Governance program at the Council on Foreign Relations. As civil war in Syria inches toward its four-year anniversary, the nation’s humanitarian catastrophe deepens. Some 7.6 million Syrians are now internally displaced, and another 3.3 million have fled to neighboring countries to avoid the complex three-way dogfight among Assad’s forces, the Islamic State in Iraq and Syria (ISIS), and Syrian rebels. In Lebanon the influx of one million refugees is straining the capacities of a country of only 4.4 million. Today, some 12.2 million Syrians, both inside and outside Syria, rely on emergency food aid. It thus came as a shock when the UN’s World Food Program (WFP) announced on December 1 that a lack of funds was forcing it to suspend aid to help feed and clothe Syrian refugees in Jordan, Lebanon, Turkey, Iraq, and Egypt. In fact, the WFP had been signaling for months that its program for Syria was in dire need of a cash injection from international donors. Last week, the United States donated $125 million to prop up the program until the end of the year, but it clearly wasn’t enough. The WFP stated that it needed an additional $64 million for December alone to support its system of prepaid voucher cards, which can be used at local stores to buy food and supplies. Without this lifeline, refugees will face the impending harsh winter without food, warm clothes, or heat. “This couldn’t come at a worse time," said UN High Commissioner for Refugees António Guterres. “I urgently appeal to the international community – support WFP now. Don’t let refugees go hungry.” The cutback is projected to hit 1.7 million Syrian refugees. Many have signaled that their best option now may be a journey back to war-torn Syria. Unless funds are found quickly, Syria’s “new level of hopelessness” might rise to new heights. The suspension of WFP aid to Syrian refugees is symptomatic of broader weaknesses in the current multilateral approach to delivering emergency relief. First, because humanitarian assistance is entirely voluntary, it is vulnerable to shifting attitudes in donor nations, particularly aid fatigue. After years of war and upheaval in the broader Middle East, major international donor governments and their electorates are weary of sending money overseas, particularly given competing domestic demands. Since 2001, donor nations have devoted hundreds of billions of dollars to humanitarian relief and nation-building in Afghanistan, Iraq, Pakistan, Libya, and elsewhere. The appetite to continue doing so is dwindling, particularly when—as in the case of Syria—it is clear that such aid is a mere palliative, unaccompanied by either a clear political strategy for a negotiated solution or a military effort to ensure the victory of one side. As the Syrian war grinds on interminably, there is bound to be dwindling support for providing endless “emergency” relief that only addresses surface symptoms. In other words, public support for addressing the consequences of war is contingent on there being an end in sight. Second, the current financial burden of providing humanitarian relief is unevenly shared. The United States has been by far the most generous donor government, having contributed approximately $2 billion to the WFP program, about five times as much as the next biggest donor, the United Kingdom. It is past time for other major donors, both established and emerging, to play their part. Most egregiously, France and China, two of the world’s largest economies, have given less to the WFP than has Ethiopia. The $64 million shortfall that compelled WFP to suspend its program is a “drop in the bucket” for either country. As long as nations like France and China abstain from pulling their weight, other nations will feel justified sitting out. Third, the humanitarian system is experiencing unprecedented demand on its limited resources. The last time this blog reported on the Syrian refugee crisis, there were three “level-3” emergencies around the world. Today, there are officially four: Syria, Iraq, South Sudan, and the Central African Republic (CAR)—not to mention the Ebola outbreak affecting West Africa. These simultaneous calamities not only distract attention from Syria, they also divert money. Iraq’s fight against ISIS has displaced approximately 2.1 million Iraqis. The civil war in CAR has led to at least 5,000 deaths and left 2.5 million people in need of humanitarian assistance. In South Sudan, 1.5 million people have been displaced and more than seven million are at risk of hunger and disease. The Ebola crisis, meanwhile, has claimed approximately 6,000 lives, according to recent reports. These competing crises are taxing the already strained resources of the WPF and other UN agencies. Rigid rules about how institutions can use funds only complicate matters. As Greg Barrow, spokesman for the WFP’s London office, explains, “Because many donations are allocated to specific programs and cannot be used elsewhere, there is a lack of flexibility in the system.” Although the scale of Syria’s crisis dwarfs the others, the WFP has little authority to reprogram the funds at its disposal. What can to be done to alleviate the humanitarian crisis, both in Syria and globally? The immediate priority is to provide WFP with the stopgap assistance it needs to resume its voucher program. The current suspension, which exposes already vulnerable populations to intolerable suffering, can be alleviated at modest cost. The WFP has embarked on a social media campaign in hopes of plugging the hole left by international donors, hoping that the world’s Twitter followers will mobilize action from derelict governments. The United States needs to complement this grassroots effort with high-level diplomatic muscle. U.S. Secretary of State John Kerry should press France, China, and other donors to step up to the plate immediately, to ensure that Syrian refugees survive the impending winter—and that nations that are hosting them in large numbers can sustain this burden. Simultaneously, the Obama administration must redouble its efforts to bring an end to the Syrian civil war—the only sure way to end the country’s humanitarian catastrophe. The administration has sought for some time to thread the needle in Syria, hoping in vain that a robust moderate opposition would emerge that could somehow triumph over both the Assad regime and ISIS jihadists. This strategy has enjoyed little success. Indeed, the focus on ISIS’ rise has directed U.S. and international attention away from Assad’s atrocities, allowing his campaign against the rebels and the civilian population to remain unchecked. Every airstrike levels buildings, destroys lives, and diminishes any semblance of normality. Without a political solution, which seems unlikely, Syrians will continue to swell in neighboring countries. External actors have sought to soften the blow on those affected, but their efforts are waning. Finally, the United States must work with other influential nations to place the global humanitarian enterprise on a firmer institutional and financial foundation. The multilateral response to the Syrian crisis suggests that humanitarian aid has an expiration date, that current voluntary funding mechanisms are inadequate, and that the WFP and existing UN organizations are easily overwhelmed by multiple calamities. The World Humanitarian Summit, to be convened by UN Secretary-General Ban Ki-moon in 2016, will provide a valuable opportunity for the United States to demonstrate its leadership in helping reform systematic and structural flaws in the current international aid regime. More immediately, the Obama administration should push for a special session of the UN Security Council to focus global attention on the disastrous security as well as human consequences of the global humanitarian crisis.